Lots of schools with computer suites are getting rid of them by turning them into ordinary classrooms. 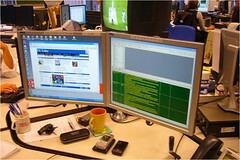 The reason is that with mobile technology such as tablets, and initiatives like Bring Your Own Device (BYOD), there is no longer any need for a computer suite. But getting rid of a computer suite is just one option: there are several others. Is the computer lab defunct? Having attended a conference at the Westminster Education Forum today on the future of technology in education, I am moved to raise this issue again: have computer labs had their day? The idea that they have was mentioned two or three times. Whilst I can see the attraction of arguments in favour of mobile technology as opposed to fixed technology, I don’t think the two are necessarily mutually exclusive. Rather than rehearse my arguments again, I’ll refer you to an article I wrote back in March 2011 called Come back, computer lab, all is forgiven. Hope you enjoy it. I am all in favour of the experiment by an ATM company in London which sees instructions in rhyming slang on some of its cash machines. People tend to be too serious, and sometimes you can achieve quite a lot in terms of making people think, or even improving learning, through the interjection of a bit of mild humour. OK, so it didn’t produce guffaws, but then it wasn’t meant to. Just about every ICT suite has notices saying what you can’t do, what is forbidden. The overall effect is to put people on edge, in my opinion. You can grab people’s attention with an unusual and slightly humorous headline, and then state a few rules. I believe that the light-hearted opening puts them in the right, ie receptive, frame of mind. Mr Freedman says: Get on with your work! This is not an emergency! Stop messing about! My coup de grace, however, was recording myself saying "Stop that and get back to your work", and assigning the sound file to one of the windows events on a stand-alone computer. It was quite humorous to see the reaction of a pupil experiencing it for the first time! Of course, it goes without saying that such frivolity will not work if you have not already established classroom discipline and have really interesting work for the students to do. My aim was to try to replicate a workplace environment, in the sense that in a normal, healthy work environment people work, have a bit of a break, exchange some banter, and get on with their work. Why should school be any different? Related article: Fings ain’t wot they used to be. This article was first published on 26th August 2009.